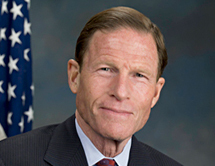 Senator Blumenthal is a lifelong law enforcement leader and strong proponent for consumer protections, environmental stewardship, and labor rights. He was an early and outspoken voice in calling for the designation of the New England Coral Canyons and Seamounts area as a marine national monument, the first in the Atlantic, to provide refuge to a myriad of unique species, to conserve a vital and productive ecosystem, and to help fuel many parts of New England’s economy. On September 15, 2016, President Obama designated the Northeast Canyons and Seamounts Marine National Monument, which protects 4,913 square miles of ocean from Maine to New York (home to 25 million people), phases out commercial fishing, and prohibits other extractive activities such as mining and drilling. He sits of the Senate Committee for Commerce, Science, and Transportation, which has jurisdiction over a wide-ranging portfolio and plays a pivotal role in American business and addressing the important issue of climate change.